Based on Ephesians 6:10-18, Paul speaks to present-day saints and the faithful in CHRIST JESUS also when he wrote to the church at Ephesus about spiritual warfare. This kind of warfare has been confusing at times with misunderstandings that an individual or persons can be the opponent when spiritual warfare is actually against certain kinds of principalities & powers, rulers of this world’s darkness along with spiritual wickedness. We cannot fight spiritual wars with natural means. In order to become effective and successful in our daily walk with the GOOD LORD, wearing the right kind of apparel is so essential. (For the Head), put on the HELMET OF SALVATION, to become transformed by the renewing of the mind and this head covering will fit any servant of GOD. 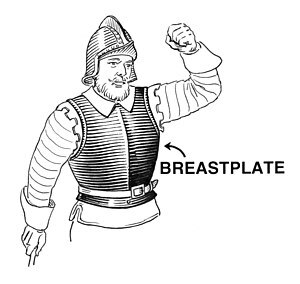 (For the Chest), put on the BREASTPLATE OF RIGHTEOUSNESS, so that vital organs will be enclosed. (For the Mid-Section), put on TRUTH, which will strengthen fully. (For the Feet), have them shod with the PREPARATION OF THE GOSPEL OF PEACE, in order to walk circumspectly and these shoes will fit any servant of GOD. Be equipped with and apply the SHIELD OF FAITH, to quench all the fiery darts of the wicked. Be equipped with and apply the SWORD OF THE SPIRIT, which is THE WORD OF GOD, because it is sharper than any two-edged sword. Continue in PRAYER AND SUPPLICATION IN THE SPIRIT, to communicate with ALMIGHTY GOD. Also, be on the lookout continually by WATCHING WITH PERSEVERANCE AND SUPPLICATION FOR ALL SAINTS.